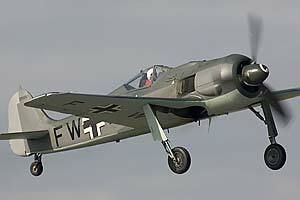 Flugwerk FW 190 takes off! 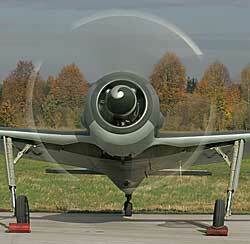 On September 29th 2004, a beautiful autumn day at Manching AFB, the Flugwerk FW 190 took off from the northern runway for its official press flight. 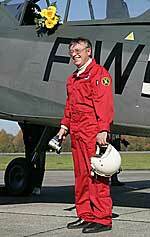 After the first hop on June, 22nd and another flight earlier that week this has been the third flight by chief test pilot Horst Philipp. The work on the FW 190 is in its final stages said Claus Colling, although the gear was not retracted due to safety reasons during that flight as Flugwerk is still missing some electric clutches that will enable to completely lower and block the landing gear in case of manual deploying. Colling said that they are being manufactured at the moment and will be built in December. I would like to thank Flugwerk for their superb hospitality that day and wish them all the very best for the next steps of the flight testing of the 'Butcher Bird'!